that are great for summer. 2 coats of 'Clowning Around' over 2 coat of Essie's 'Yogaga'. 'Clowning Around' is a clear base that's packed with neon pink micro glitter, & various sizes of neon blue, yellow, orange, green, purple, & pink hex glitter. 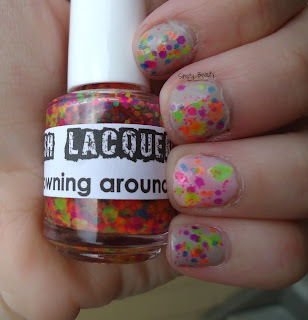 This is without a doubt, one of my favorite new polishes. i am obsessed with neon glitter!